There is much whispering among golfers in our Villa Sothebys real estate office this morning. Sometime next month, one of Rancho Santa Fe’s prized properties will be listed by our firm (via Tina Colburn) . This two-acre golfers estate has enormous frontage on the Rancho Santa Fe Golf Course (the largest, in fact), yet offers total privacy. The residence is a 6000 square-foot classic California contemporary with softened architectural lines. It provides 5 bedrooms, 5.5 baths and garaging for 4 cars. All bedrooms are large and en suite, while the very large master bedroom is located downstairs with two other bedrooms. One of the upstairs bedrooms is currently used as an office, favored for its terrific views. This property is currently a pocket listing and will not be going into the San Diego MLS until next month. Given its singular Rancho Santa Fe location, this offering may well be sold before that time. Priced at $4.8 to $5.2 million. Other homes with golfer advantage in Rancho Santa Fe might include one (or more) of the homes below. 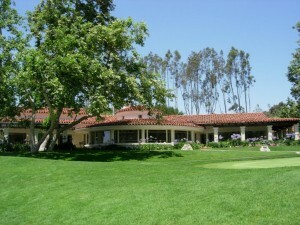 Incredible Del Mar Country Club opportunity on a picturesque golf course view lot. This classic 4+ bedroom home has been beautifully refreshed while still holding onto its French charm. Executive office with fireplace, chilled wine room, spacious master is light and bright with vaulted ceiling, floor to ceiling windows and expansive viewing deck. Exceptional outdoor living accompanied with a gorgeous pool, spa, bbq area, fireplace and a Koi pond - all overlooking the immaculately manicured 9th fairway. Designed by internationally recognized architect and artist Wallace Cunningham known for creating a timeless image using: place, form and light, opening structures to the sky, landscape and views. Located in the guard-gated community of Rancho Santa Fe Farms, set on an exceptional golf course frontage site uniquely positioned with unobstructed?ocean and golf course views. Disappearing panels of glass, welcome the outdoors in, creating an open air-pavilion where the indoors and outdoors become one. Beautiful Mediterranean Equestrian Estate with dramatic and panoramic views of Crosby Golf Course and hills and valleys of Rancho Santa Fe. The home is appointed with exquisite design features and materials including extensive use of travertine and marble. There is a large entry-level en suite bedroom with it's own terrace. MASTER ON FIRST LEVEL-LOWEST PSF PRICE IN WP- end unit, flooded with natural light. Rarely available plan with two master suites, one on each floor, third bedroom/office on first level with full bath. Privately gated, offering two pool/patio venues and gorgeous landscaping. Ideally located to freeway, shopping, schools, beach. Morgan Run CC and golf course within walking distance. One of the Finest homes in Desirable Whispering Palms in RSF! Beautifully Rebuilt in 2008 Using Quality Materials & Workmanship. Meticulously Maintained Residence Offers Custom Design, Dramatic Entry with Circular Staircase, Stunning Travertine Throughout, Gourmet Kitchen with SS Appliances. Gorgeous Open Floor Plan Flows to Outdoor Living. Stroll to Morgan Run Country Club with Golf Course, Tennis, Gym, Heated Pool &Spa, Restaurant & Bar. Be Part of the Wonderful Lifestyle w/ Coastal Convenience! Based on information from California Regional Multiple Listing Service, Inc. as of April 20, 2019 06:38 and/or other sources. All data, including all measurements and calculations of area, is obtained from various sources and has not been, and will not be, verified by broker or MLS. All information should be independently reviewed and verified for accuracy. Properties may or may not be listed by the office/agent presenting the information.